Derek Selvig will be one of the key pieces for Montana this year, as he is their lone returning big man with a lot of experience, and could be an All-Conference player this season. 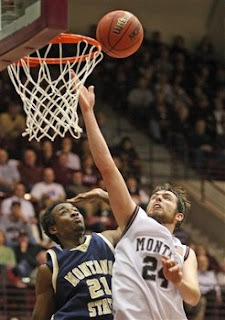 Posts on the Montana message board speculated that it was a sprained ankle and did not look very good. Either way, you have to figure if he did get hurt, his availability for the season opener next Friday against Colorado State could be in jeopardy, which would be a blow for the Griz. I will pass along any more information if I hear it. But what really put a damper on the evening was when senior leader Derek Selvig - the team's leading scorer with 15 points - went down with an injury to his left ankle or foot. Afterward, he wouldn't guess what the injury might be, but left the arena on crutches. "You could see the wind came out of our sails when he went down, so that was tough," Tinkle said. "Injuries happen. We're going to have to get him healthy, get him treatment and see what happens in the next 3-4 days. We've had guys with high ankle sprains where they're out over a month. I'm encouraged by guys like Mathias (Ward), Billy (Reader) and (Eric Hutchison). We have guys we can throw it to. If we play that poorly on the perimeter, maybe we'll just have to walk it up and throw it in there."